President Donald Trump congratulated his new Mexican counterpart in a tweet. President Donald Trump said Monday he has had a 30-minute phone call with the newly-elected leader of Mexico, Andres Manuel Lopez Obrador, discussing trade, border security, the North American Free Trade Agreement (NAFTA) and the possibility of a Mexico-U.S. trade deal. "I think the relationship will be a very good one. We'll see what happens," President Trump told reporters in the Oval Office about the call earlier Monday with Mexico's president-elect, adding that the election was "better than anticipated." The comments from Lopez Obrador come after Trump congratulated his new Mexican counterpart after his overwhelming presidential win Sunday. Lopez Obrador called Trump's tweet "very respectful." Nicknamed ALMO, he is a populist ex-mayor of Mexico City whom the Mexican voters are anticipating will change the country’s political climate after their discontent with the current president Pena Nieto and his Institutional Revolutionary Party (PRI) that ruled for over 70 years since 1929. Throughout his election campaign, Obrador has been openly critical of President Trump and his proposed border wall. “When a wall is built to segregate people or when the word “foreigner” is used to insult, disparage and discriminate our fellow men, humanity, intelligence and history are being insulted,” said the president-elect, who will take office in December, in a speech in Los Angeles last year explaining the need to “counteract” Trump’s strategy. Despite the harsh talk during his campaign and his visits to the U.S., Obrador said in his acceptance speech Sunday that he will seek a relationship of "friendship” and “respect" with the U.S.
(Daniel Becerril/Reuters) Mexico's President Enrique Pena Nieto addresses the media after casting his ballot at a polling station during the presidential election in Mexico City, Mexico July 1, 2018. 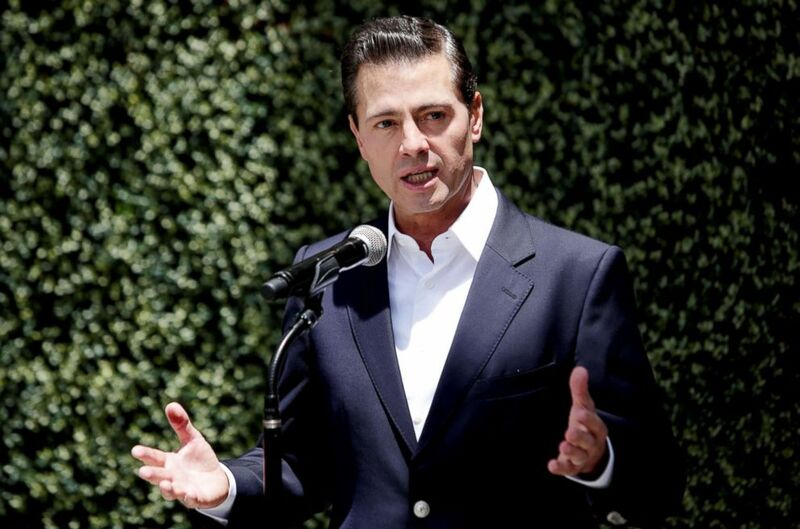 In February, Trump and Pena Nieto canceled a planned U.S. visit by the Mexican president. in addition to the border wall issue, the two countries are at odds over Trump's demand that NAFTA be renegotiated or even abandoned.